CALGARY, Alberta (AP) -Just when it appeared the Calgary Flames might steal a win, the Nashville Predators came back and got the two points they felt they deserved. J.P. Dumont scored 2:13 into overtime, leading the Predators to a 2-1 victory Friday night. "We deserved the two points tonight and we got it," Dumont said. Scott Nichol also scored for Nashville, which moved past Vancouver into a tie with Colorado for seventh place in the Western Conference. Craig Conroy had the lone goal for Calgary, which stayed tied with Minnesota atop the Northwest Division after the Wild lost to Atlanta. As Adrian Aucoin attempted to carry the puck up the boards deep in the Flames' end, Dumont knocked the puck off his stick and it went to Alexander Radulov cutting through the slot. Radulov's shot hit the goalpost, but the puck bounced to Dumont, who pounced on the empty net for his 26th goal. "I saw Aucoin coming out of the corner with the puck and I knew he was going to try and make a pass, so I just played the man and was able to knock the puck down to Radz," Dumont said. "I went to the net and the puck hit the post and came right onto my stick." Tied at 1, Calgary nearly pulled ahead with four minutes left but Cory Sarich's wrist shot from the blue line through a crowd rang off the goalpost. The Flames got another chance to win it when Radulov got called for closing his hand on the puck with two minutes left in the third. However, the Flames' power play couldn't produce the winning goal, ending 0-for-6 with the extra man. In the last six games, Nashville has killed of 29 of 31 penalties. Trailing 1-0 after two periods, Nashville tied it at 8:58 of the third when Nichol burst down the wing into the Flames end and fired a wrist shot from a sharp angle that deflected off Miikka Kiprusoff's shoulder and into the top corner. The goal ended Kiprusoff's shutout streak at exactly 115 minutes. The only goal of the opening 40 minutes came at 11:38 of the second period off a turnover deep in the Nashville zone. Ryan Suter's pass across the ice to Shea Weber skipped past Weber's stick and caromed sharply off the side boards and into the slot. Conroy swooped in and ripped a shot into the top corner past Dan Ellis. "After I had scored, I had another great chance and I needed just to get it up a little bit higher, then it's 2-0 and it's over," Conroy said. "We have to get that killer instinct. We get one goal, then we maybe feel like we're just going to hang on." On the heels of a 39-shot shutout Tuesday night against Columbus, Kiprusoff was again spectacular while making 33 saves - including 14 in a first period dominated by Nashville. Jerred Smithson had the best chance in that opening 20 minutes, but his one-timer from the slot was smothered by Kiprusoff. After getting pulled Thursday night in Vancouver after giving up three goals on 11 shots, Ellis was back in net for the Predators. He was far less busy early, although he finished the night with 29 stops to improve to 18-7-2. "We had a quick turnover and he only played five or six minutes last game," Trotz said. "I said this is going to be tough night. I need the freshest goalie. Ellis has been a good goalie for us and he responded really well." Notes: Jarome Iginla failed to score and remains at 364 career goals, tied with Theoren Fleury for top spot on the Flames' list. ... Ellis finished with 29 saves to improve to 18-7-2. 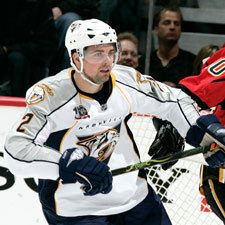 ... Calgary D Cory Sarich returned to the lineup after being a healthy scratch the past two games. His returned pushed veteran D Rhett Warrener to the sideline. 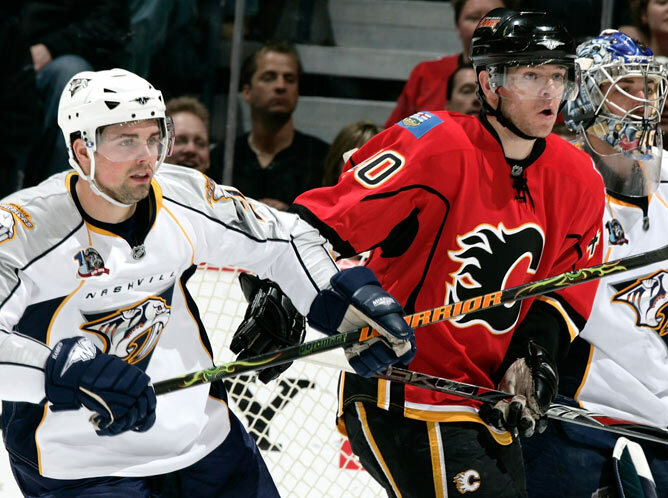 ... Nashville finished 10-8-2 against the Northwest Division.